Conventional small molecule drugs and large macromolecular drugs have significant and distinctly different delivery barriers. For example, small molecule drugs, such as the chemotherapeutic doxorubicin, is highly hydrophobic, thus administration requires toxic cosolvents to aid blood solubility. Macromolecular drugs, on the other hand, suffer from enzymatic degradation and inactivation, difficulty in targeting to the appropriate cells and transversing the cell membrane, and often become degraded intracellularly once endocytosed. We are investigating polymer-drug complexes or polymer-drug conjugates to overcome these barriers and modulate drug delivery. Figure 1. 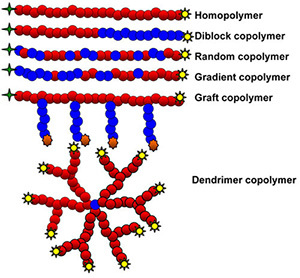 Versatility of RAFT polymer architecture, where one monomer is depicted as red balls and a second, distinct monomer is depicted as blueballs, and functionality through telechelic chain ends (in green, yellow, andorange). Specifically, we synthesize polymers using reversible addition chain transfer polymerization (RAFT) techniques that enable the synthesis of many varied polymer architectures (linear, block copolymers, dendrimers, graft copolymers, gradient polymers), afford succinct control over molecular weight and polydispersity, and provide telechelic chain ends, amenable to further functionalization for drug conjugation or addition of cell/tissue targeting molecules, as detailed in Figure 1. We are focusing on the design and development and in vivo use of delivery systems to treat diseases such as osteoporosis, Crohn's disease, and cancer. 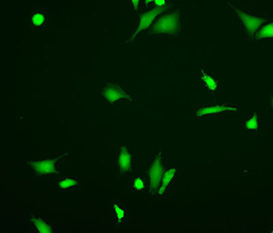 Hela, cervical carcinoma cells, are monitored morphologically using Calcein AM. 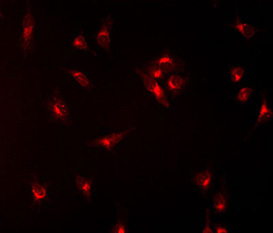 The endosomes and lysosomes of Helas, cervical carcinoma cells, are imaged (at 20x magnification) as many macromolecular drugs are trafficked to these intracellular compartments. 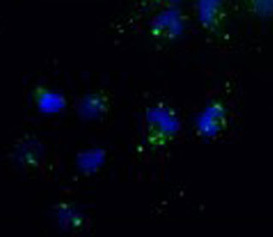 The endosomes and lysosomes of Helas, cervical carcinoma cells, are imaged (at 40x magnification) as many macromolecular drugs are trafficked to these intracellular compartments. 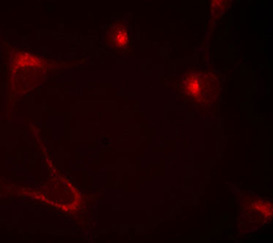 siRNA, a macromolecular nucleic acid molecule, is primarily internalized and trafficked into endosomes and lysosomes in Hela cells, where it is subsequently inactivated, using a commercially available delivery system. Polymer delivery systems can be designed to achieve cytosolic delivery of siRNA. 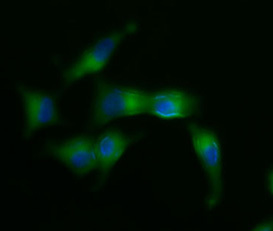 Here, cytosolic delivery is indicated based on diffuse green staining (green = siRNA, blue = nuclei). 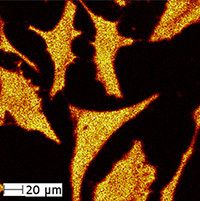 Using a high-resolution and quantitative imaging technique, time-of-flight secondary ion mass spectrometry (ToF-SIMS), the total ion image can be produced of Hela cells. By monitoring where and how much drug is within cells, we can design and implement more favorable delivery systems.